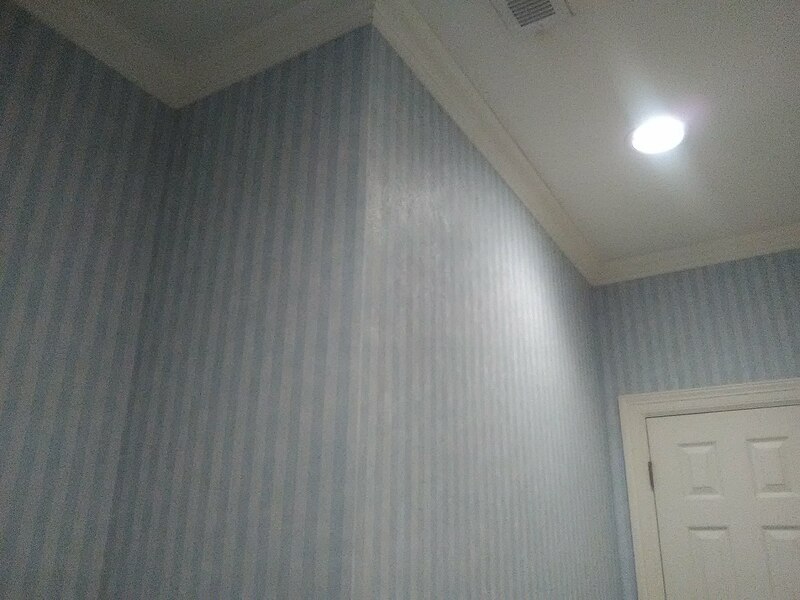 The walls in this powder room in the West U neighborhood of Houston had had many treatments over it’s life, including paint, more paint, skim-floating, wallpaper, and more. Sometimes, and particularly if prep is not done properly, these various layers are not compatible, and won’t adhere to one another well. When the old wallpaper was removed, this was clear at the seams, where the various layers of the wall had pulled apart, leaving ridges along the length of each seam. 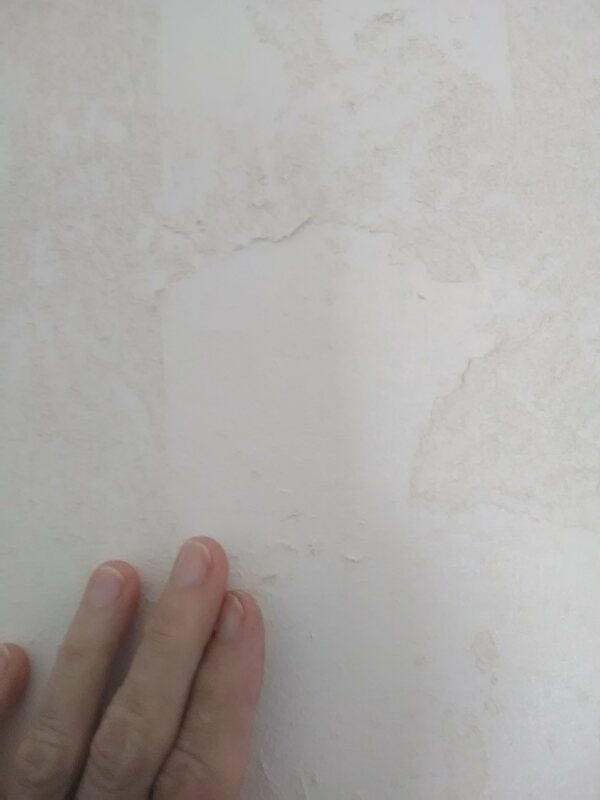 This happens because the wallpaper dries and pulls taught and creates tension on the wall; if the wall is unstable, the layers can be pulled apart (delaminate). Sorry, no pics of the “before,” but you can do a search here to see pics of other rooms. This condition can happen over time, as the house fills with humidity and the paper absorbs it, then dries and shrinks again. I dug out the raised ridges and applied tape over them, sealed with Gardz, a penetrating sealer that dries hard. Then I skim-floated over all the walls, to create a smooth surface for the wallpaper. Sanded, wiped dust off with a damp sponge (nothing sticks to dust), and primed all walls with Gardz. One good way to deal prevent this from happening again is to cross-line the walls with a special liner paper. 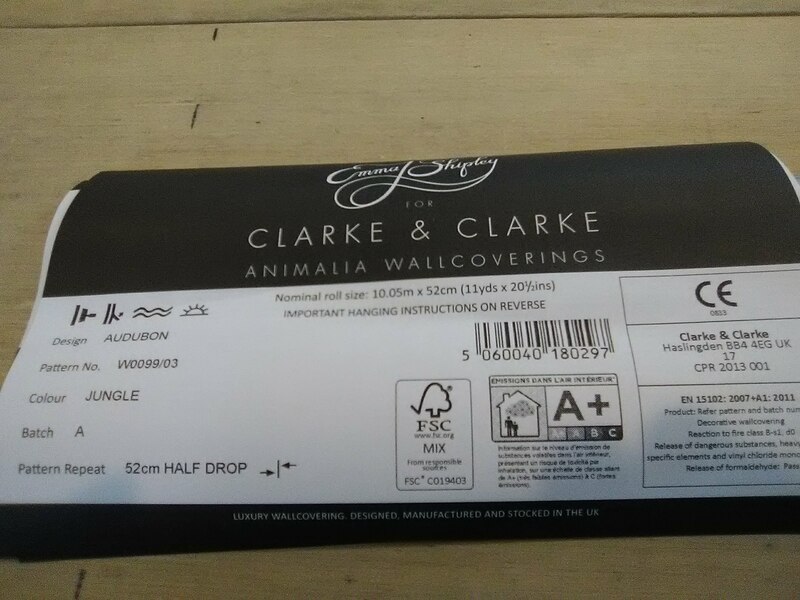 This is a thin paper that is usually run horizontally before the actual decorative paper is hung. The idea is that if the new paper shrinks and applies tension, it will be distributed by the liner paper, and will not pull at the wall. If the liner shrinks and pulls, the tension is off-set by the decorative paper on top of it. So the two layers are working together to distribute any harmful tension on the wall surface. From Office Max I got some plain old cash register tape. I plotted where each seam would fall, and used my laser level to guide placement of a floor-to-ceiling strip of the tape. I adhered it with regular wallpaper paste. At first, I worried that it would soak up moisture and bubble, but once it was smoothed into place, it laid down nice and flat. Then I hung the wallpaper. The seams fell nicely on top of the tape, held tightly, and looked beautiful. There is the possibility of seeing a very slight ridge under the paper because of the thickness of the tape, but it’s very minimal because the tape is quite thin. And it’s much preferable to popped seams or delaminated walls. 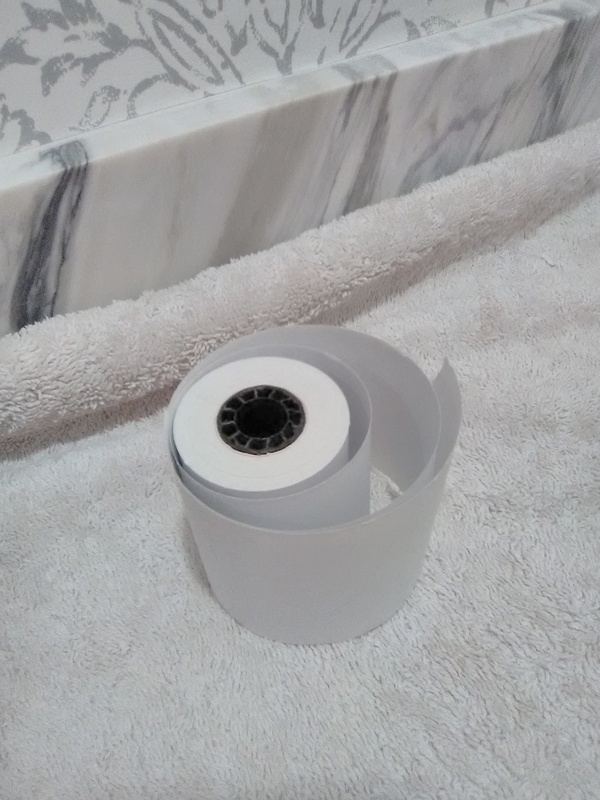 The idea is that the tape will bridge the seam, and distribute tension from the drying paper across the width of the tape, keeping tension away from the wall itself. The tape is very thin, and doesn’t appear to have much tensile strength, but my buddies who have tried this method say it works well. Time will tell, but I have a lot of confidence in this method. If you look closely, you will see tiny tan dots all over this wallpaper. 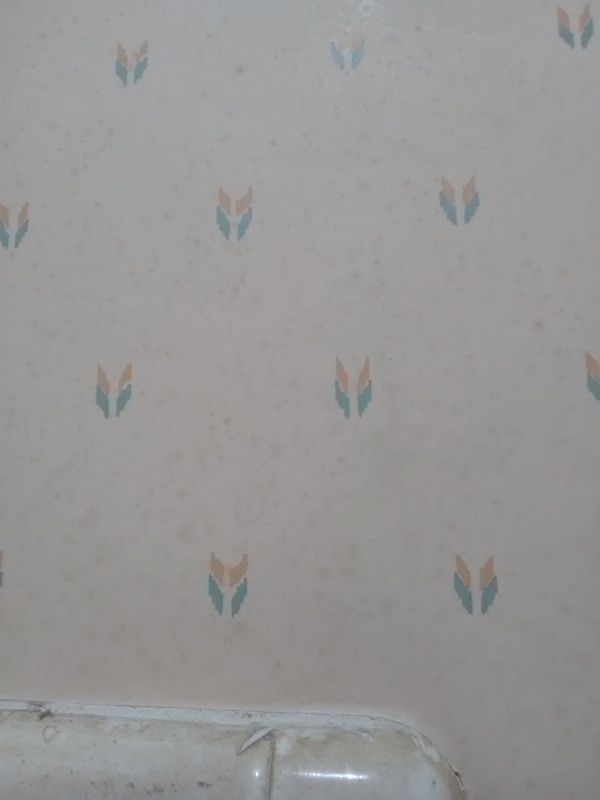 This is a paper wallpaper with a very light acrylic coating, that was installed maybe 30 years ago. The installer did a very good job – although he did not remove the previous layers (2!) 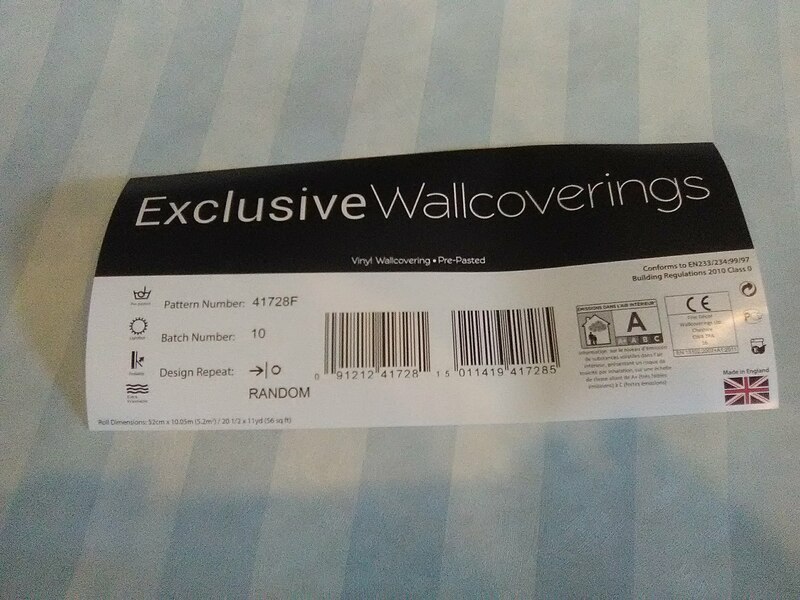 of wallpaper backings, and did not use a primer. I see spots like this almost exclusively in bathrooms – where you have enclosed spaces, toiletries, and humidity. Since these dots are most prevalent around the upper areas of the room, I think they are stains from air-borne substances. 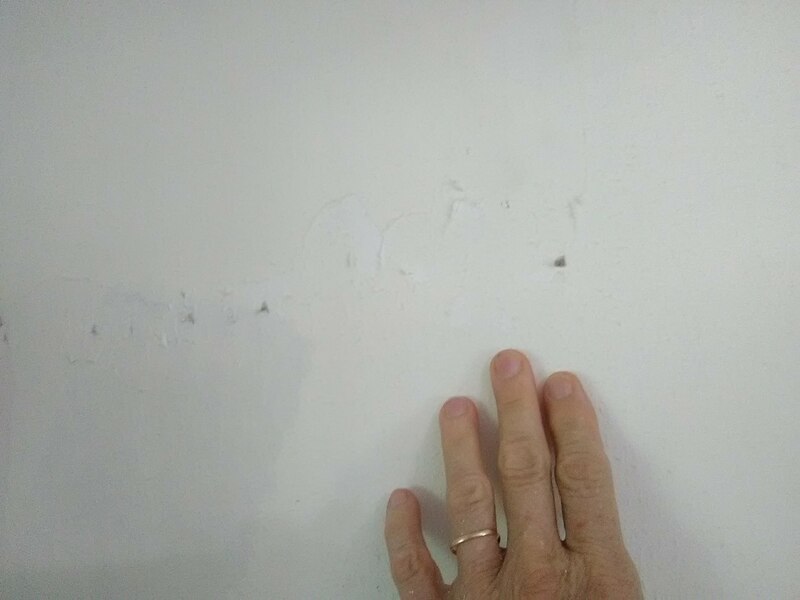 However, an alternate theory is that they could be stains leaching through from the tan backing paper that was left on the wall, or possibly from the clay-based paste that was used for the installation. The stains could even be coming from cooking oils that splattered into the air, got sucked through the A/C ducts, and expelled into the bathroom. Since this paper has just a light acrylic coating and no durable protective vinyl coating, most any substance floating around in the air would be able to land on the paper and penetrate into it, leaving these spots. Don’t get me wrong – I MUCH prefer these thin acrylic-coated papers over thick vinyls and non-wovens. You just need to take appropriate steps to protect them. 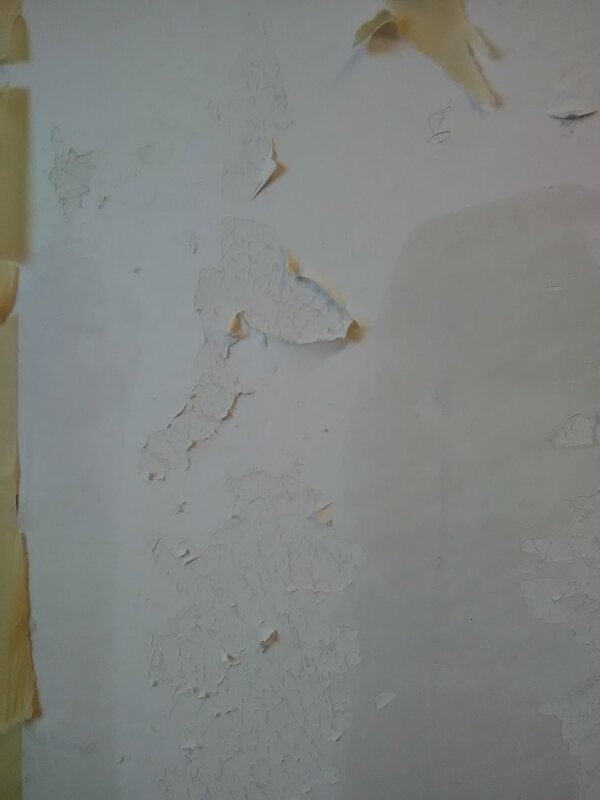 Another possibility is because the installer didn’t remove the previous layer(s) of manila-type paper backing left from the original wallpaper installation(s), nor did he use a primer or sealer, it’s possible that chemicals from the old tan paper backing are leaching through onto the new wallpaper. Getting back to our bathroom in Tanglewood (Houston). Another very possible cause is the clay-based paste that was used to hang the wallpaper. 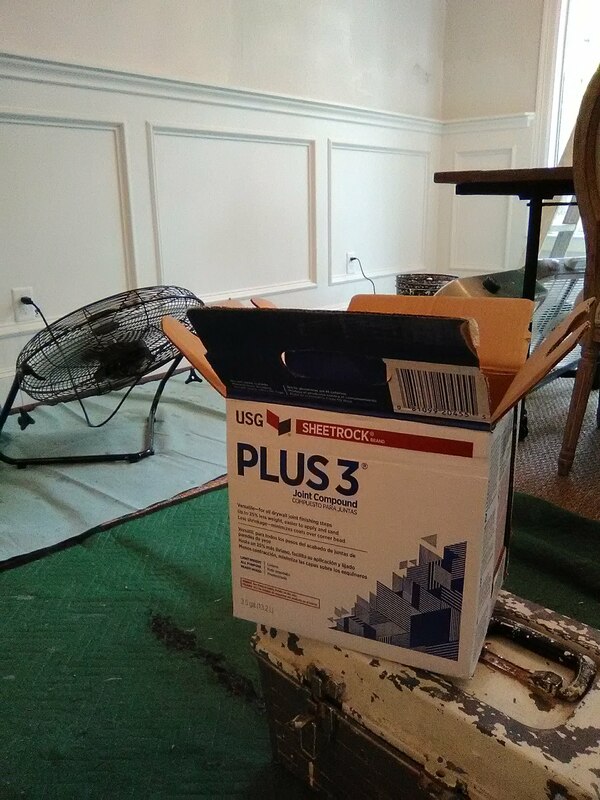 I have seen many, many times, a “dirty,” tan discoloration coming through from underneath the paper, which I firmly believe is coming from the tan-colored clay-based paste that many installers like to use. I have many instances validating this theory. The only discrepancy is that stains from the paste working their way through the wallpaper would not manifest as tiny, perfectly round specks, but as more generalized, mottled areas. Unless, the composition of the wallpaper included teensy dots in the paper fibers, intended to allow for porousity. Or humidity in the room forms miniscule droplets which land on the wall and then wick the tan paste up through the wallpaper. Which sounds reasonable to me. In fact, I like this theory a lot. And I really DISlike clay-based paste. 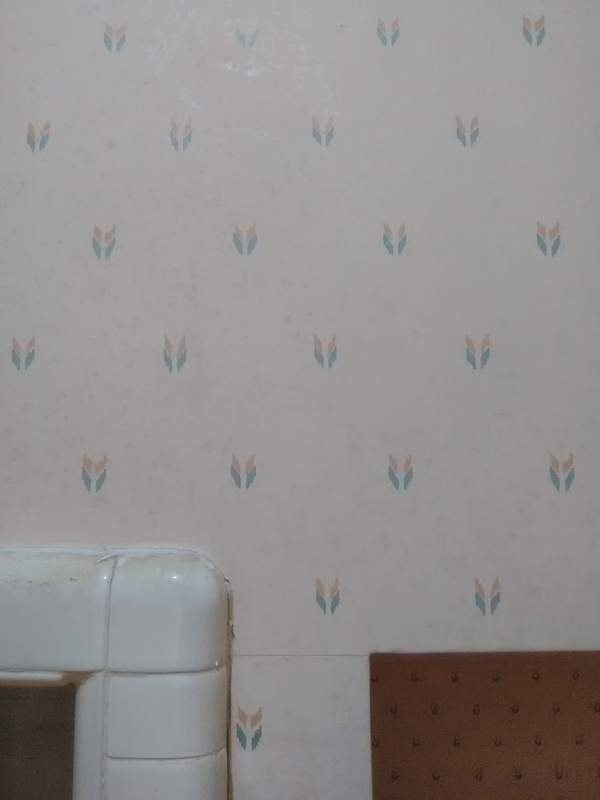 A final idea is that the wallpaper is just old. After 30 years on the wall, materials are bound to break down, humidity will take a toll, and it will be time for a change to a fresh new look. Bottom line: Remove old wallpaper, properly seal and prime the walls, avoid clay-based pastes and instead use a clear wallpaper adhesive. Check back tomorrow for more! I’ll be the first to admit – I love a darkly decorated room. 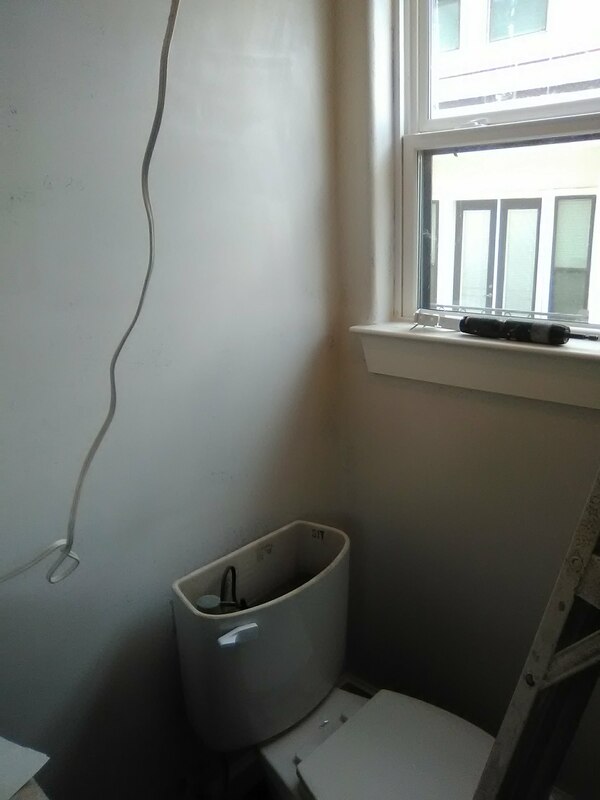 But this all-black powder room in the home of a young couple in the Heights neighborhood of Houston was not making the grade. With shiny black paint on all four walls, there was nothing to define the room. You literally could not even see where one wall ended and another began. And the work had been done poorly, with zillions of bumps and bits of stuff stuck in the paint. My first task was to use Liquid Sandpaper to degloss the shiny paint. Then I skim-floated the walls to smooth over the irregularities. Sanded smooth, wiped off the dust with a damp sponge, then primed with the penetrating sealer Gardz. Sorry, no pic of the prepped walls. The new homeowner was fine with the dark idea, but she wanted something fun and a little sassy, that would wake you up when you walk into the room. 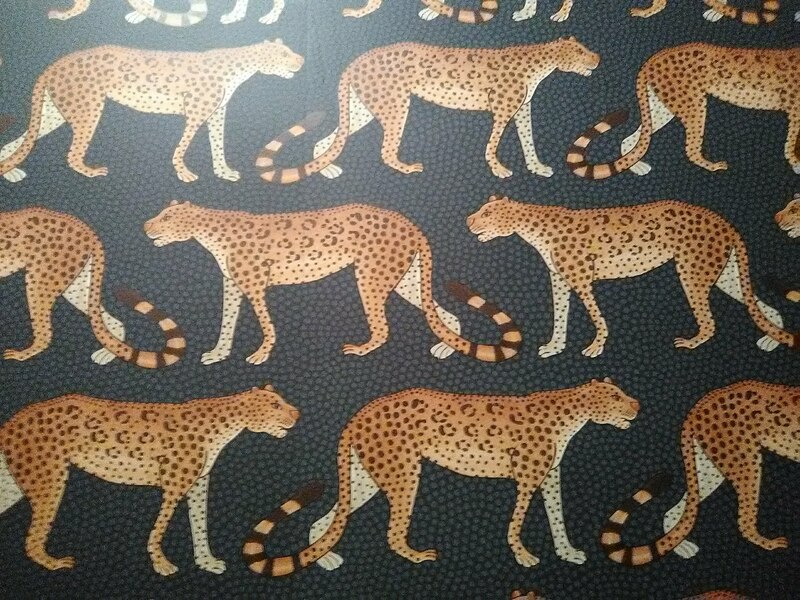 These marching rows of leopards do just that! The new wallpaper is still dark. But not quite as dark. And because it has pattern and some variations in color, you can easily see the corners, and each individual wall. The room is no longer stark and oppressive, but warm and fun. 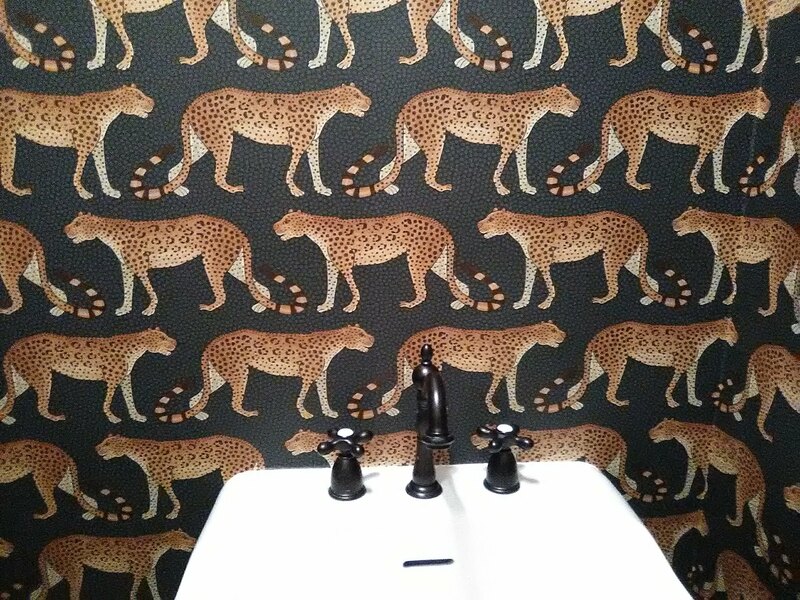 This wallpaper design is called Leopard Walk, and is by Cole & Son, a British company. It is a thin and flexible non-woven material with a vinyl surface that will resist splashes and stains better than most papers. 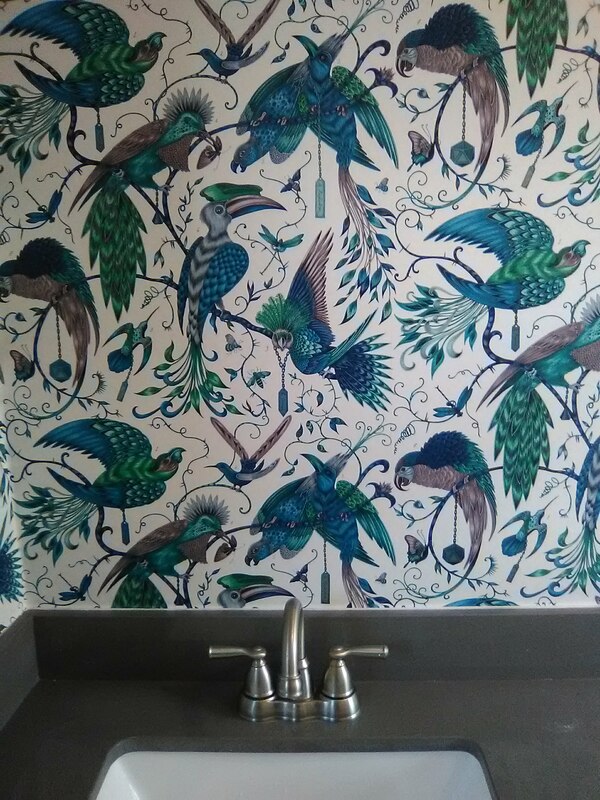 A lot of clients tell me they love birds, and are seeking wallpaper patterns with foliage and birds. (Do a Search here (upper right corner) on the word “birds.”) Most of those are what you would call sweet patterns. This design, on the other hand, can only be called BOLD. The homeowner, also in the Houston Heights, is the sister to the guy mentioned in yesterday’s post. As you can see, they share an adventurous taste in decorating! 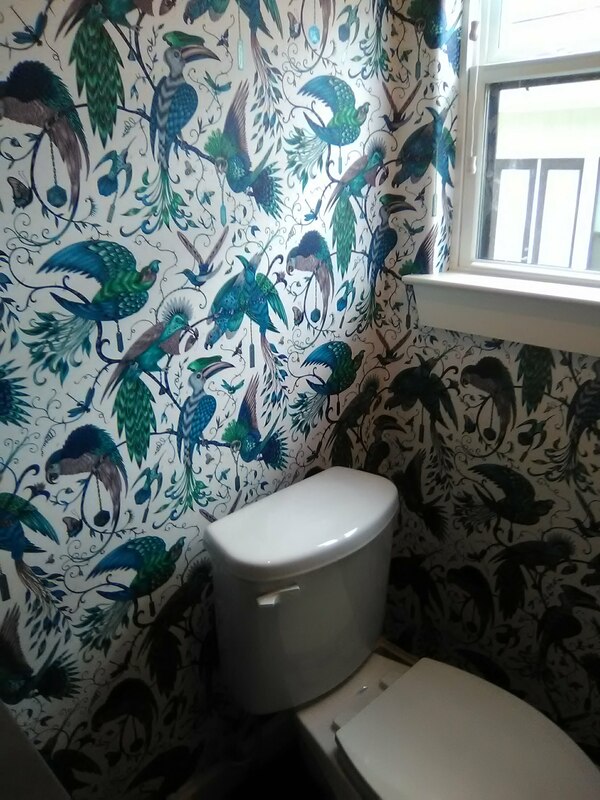 Although the pattern has a lot going on, it doesn’t feel busy, even in a powder room, partly because of the fairly homogenous color scheme, and also because of the all-over placement of the design elements. Besides, who can resist those intense faces? My favorite is the owl-like bird staring you dead in the eye. The walls in this new home were heavily textured, so I had to smooth them first (see top photos) and then prime with a penetrating sealer called Gardz. 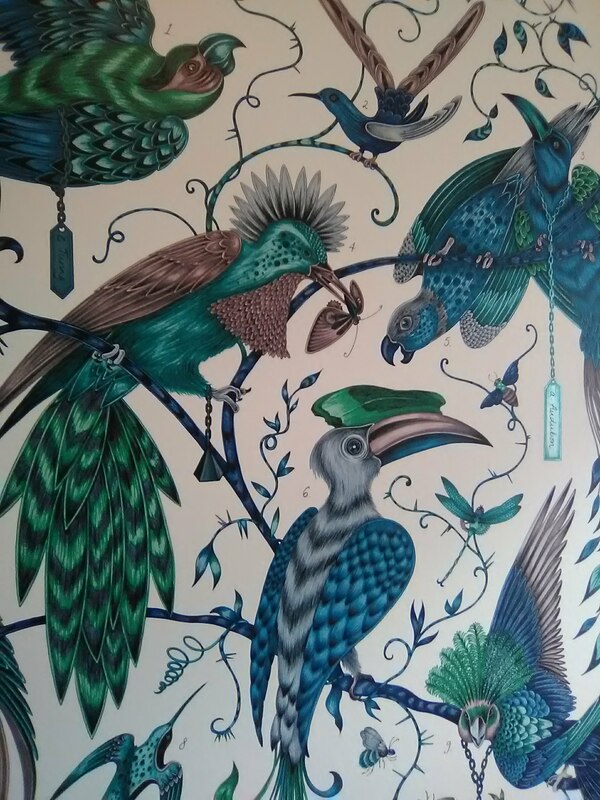 This wallpaper pattern is by Clarke & Clarke, a British company. 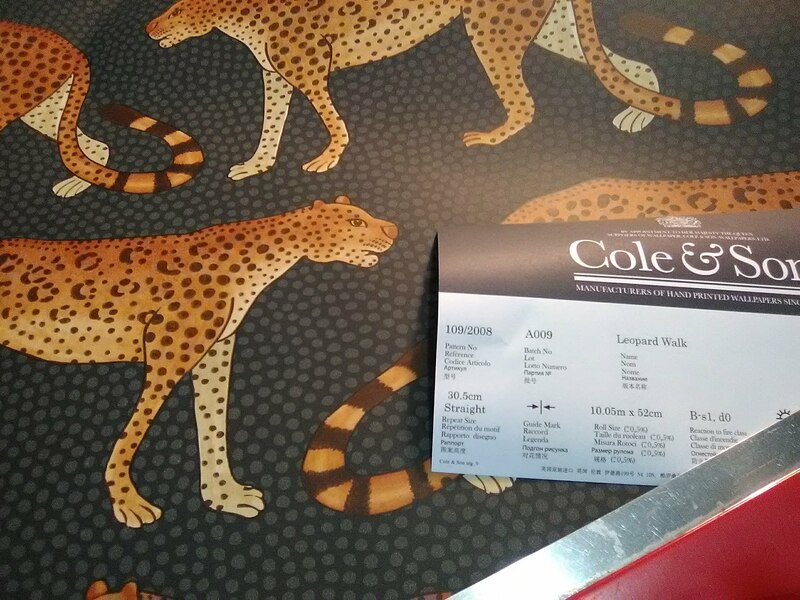 As are many British products, it is printed on a non-woven substrate and is quite durable. It can be dry-hung using the paste-the-wall method – but I prefer to paste the paper. It was a little easier to work with than yesterday’s paper, being thinner and softer and less prone to creasing. This was bought from my favorite source for good quality, product knowledge, expert service, and competitive price – Dorota Hartwig at Southwestern Paint on Bissonnet near Kirby. (713) 520-6262 or dorotasouthwestern@hotmail.com. She is great at helping you find just the perfect paper! Discuss your project and make an appointment before heading over to see her. This home in the Meyerland neighborhood of Houston was flooded during Hurricane Harvey, and has been redone, and is now ready for final touches, like decorating, i.e. – wallpaper! What you are looking at is where the contractor ripped off the top, inked layer of the original wallpaper. Most of them don’t realize that there is a backing layer of paper that is left on the wall, that should be removed, too. Simply soaking this with a wet sponge will reactivate the paste and allow the paper to be removed easily, and with no damage to the wall (esp. if there is a good primer underneath the paper). Read my page to the right “How to Strip Wallpaper” to see how this should be done. 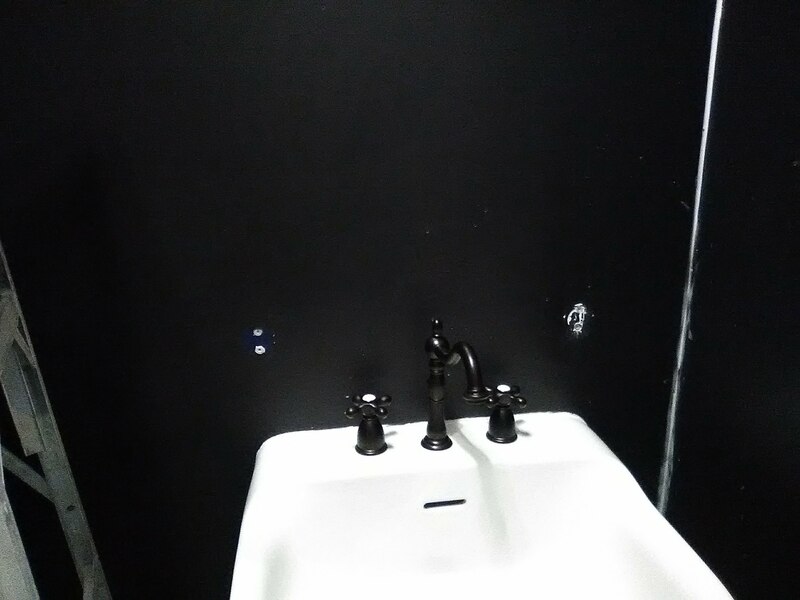 Instead, this contractor left the paper backing on the wall. Some of this porous backing is exposed. Other areas have been covered with the paint that was used on the woodwork. This solvent-based paint “raises the grain” of the surface it’s applied to – see all the hairy fibers from the wallpaper backing that have gotten stuck in the paint and raised up? Some of them are more than 1/4″ high. They create a gritty feeling on the surface, like really coarse sandpaper. 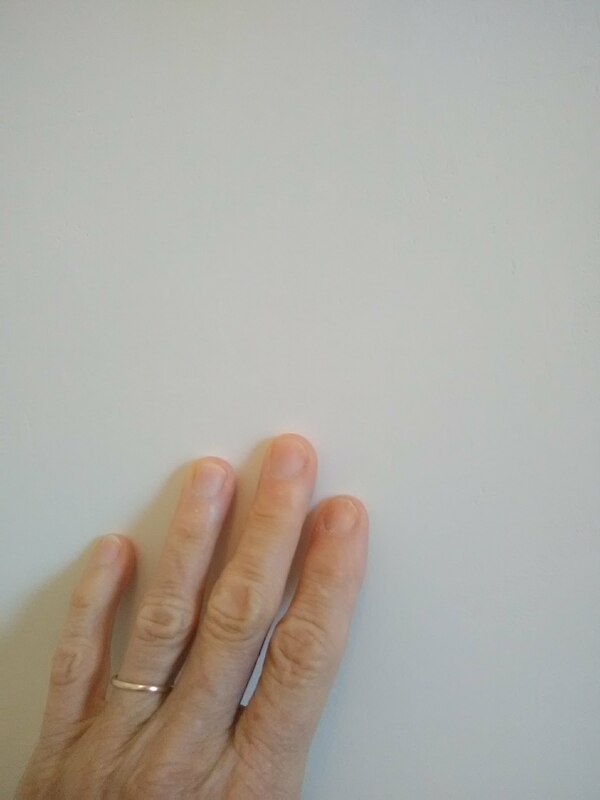 The surface is uneven, and the bumps will show under the new paper. The unevenness also means that areas of the paper will not be able to contact the wall, so there will be gaps and air bubbles and poor adhesion. 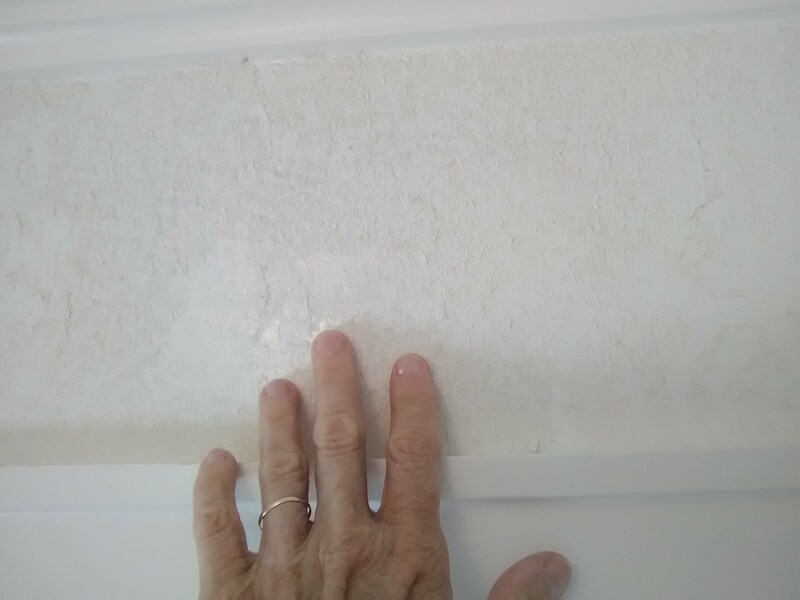 The backing of the original wallpaper has been exposed, and when new, wet, pasted wallpaper gets placed on top of that thirsty paper backing, it will absorb moisture, expand, and bubble. I had three missions. 1.) Seal the surface 2.) Smooth the surface 3.) Prime with a wallpaper-appropriate primer. I rolled on a coat of the penetrating sealer Gardz to seal the surface, so that my following treatments would not cause the paper backing to bubble. When that was dry, I skim-floated the wall with a coat of joint compound. In the areas where the hairs were 1/4″ high, the skim coat was pretty thick, and took a good while to dry. Once that was dry, I sanded it smooth, then vacuumed the dust of off the floor, used a damp sponge to wipe residual dust off the walls, and then followed up with another coat of Gardz. It will soak into the joint compound and dry hard, forming a stable surface for the new paper to adhere to. The last photo shows the wall once I finished. 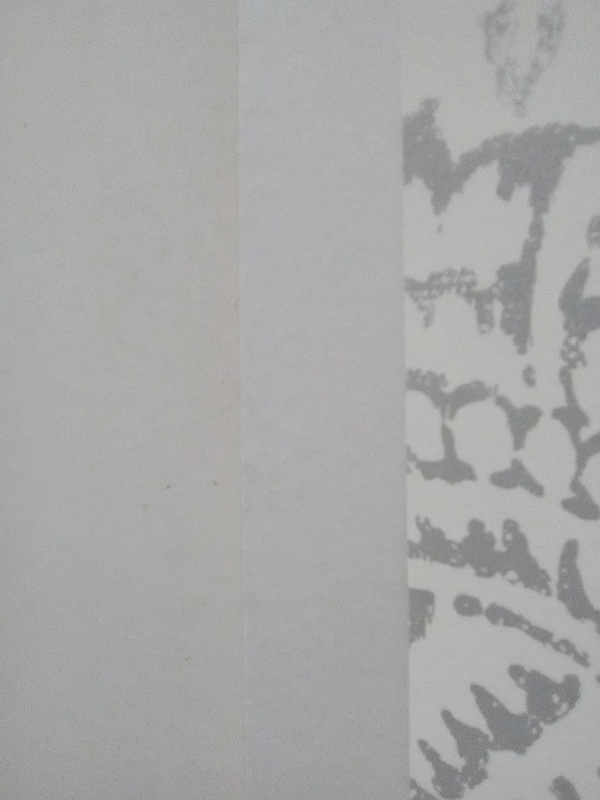 I like walls to be nice and smooth when the wallpaper goes up, first so the texture doesn’t show under the new paper, and second so the paper has an intact, flat surface to grab ahold of. When homes have textured walls, I skim float them with joint compound (which we calls mud) to smooth them. To skim float, I use a trowel to spread the smoothing compound onto the walls. 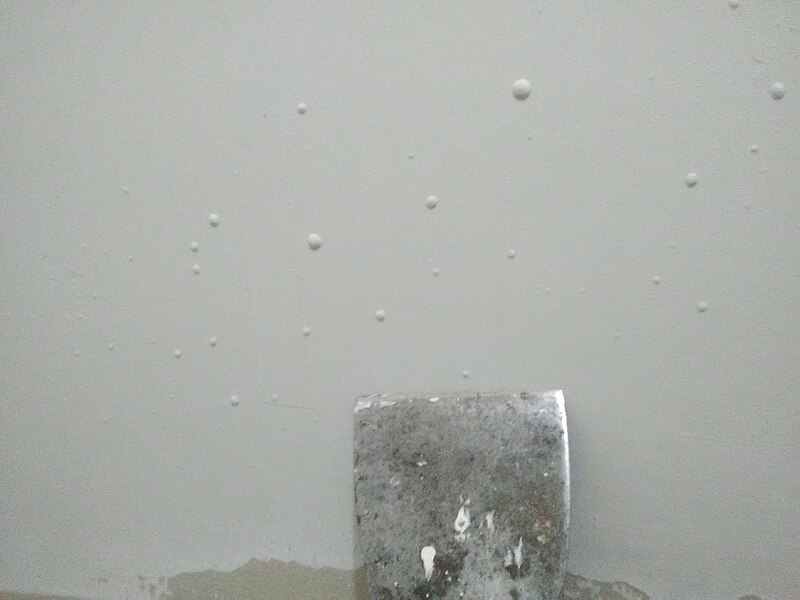 In the top photo, the upper portion of the wall has been skimmed, and you can see the compound drying around the edges and in high areas. It goes on grey, and when it’s dry, it will turn white. The second photo shows the box that the mud comes in, enclosed in a plastic bag, to retain its moisture. Once the mud is dry, I sand the walls smooth, then vacuum up the dust that falls to the floor, then wipe residual dust off the walls with a damp sponge, and then finally prime the walls. 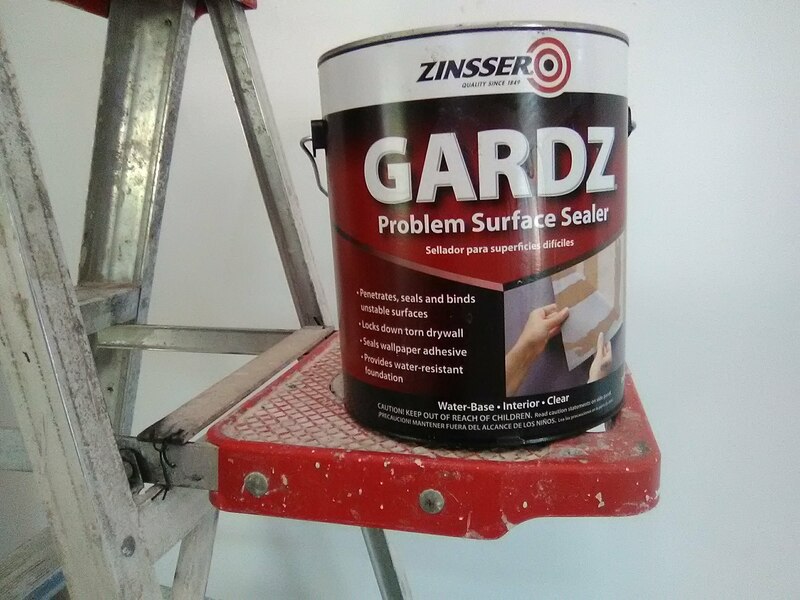 For this application, I use Gardz, a penetrating sealer which soaks into the joint compound and binds it together, and which is also a good primer to hang wallpaper on. Sorry, no photo of the Gardz or of the finished wall – but you can Search here to find previous posts. 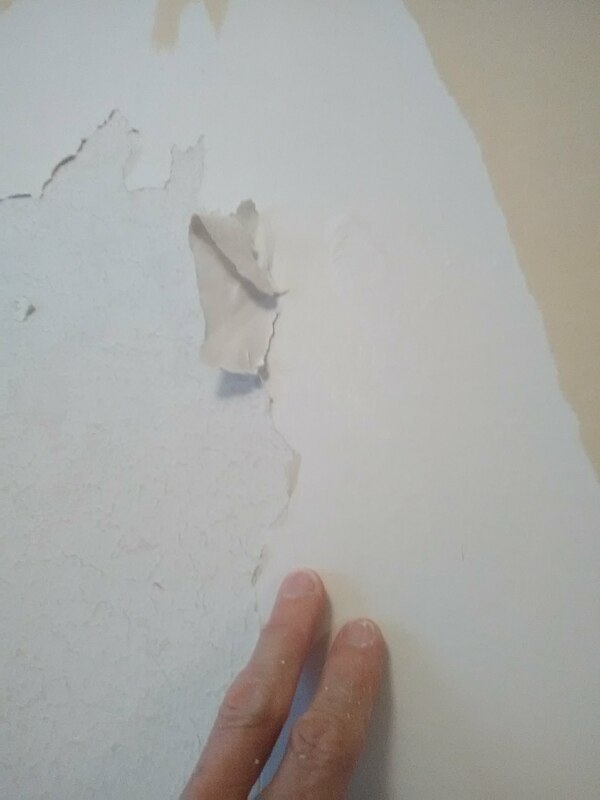 I was stripping wallpaper by peeling off the top vinyl layer and then soaking the paper backing to reactivate the paste so the paper could be removed from the wall – and ran into this. 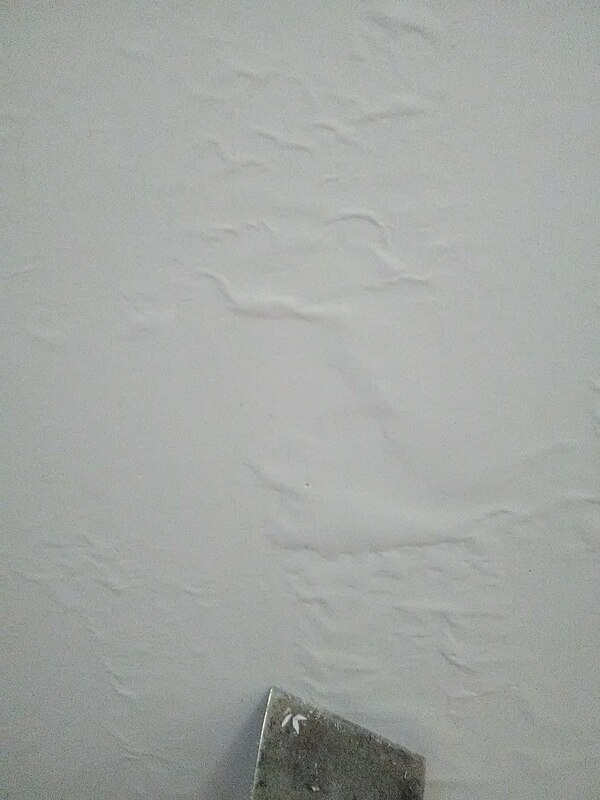 It looks like the previous installer smoothed the wall (which is good), but used a latex spackling compound instead of the more typical joint compound. The latex became wet from the water I was using to soak off the wallpaper, and began to pull away from the wall. This is all bad, because it leaves a bumpy mess on the wall that will show through the new paper. But worse is that it is an unstable surface for the new paper to try to hold on to. When wallpaper paste dries, the paper shrinks and puts tension on the surface below, particularly the seams. If the surface is not solid, the layers can actually come apart (delaminate) resulting in curled or gapping seams. This is not “loose paper,” and cannot simply be glued back down. The different layers inside the wall are actually coming apart, and will require a lot of work to make the wall sound again. Once the paper was off and the wall was good and dry, the layers seemed to adhere to each other better, and the wall felt more solid. The way I treated it was to roll on a coat of Gardz, which is a penetrating sealer that binds things together. It did a good job. Then I skim-floated over that with joint compound, which, when sanded, would leave a nice, smooth surface. One more coat of Gardz on top of that, and the wall was sound and ready for wallpaper. After the mud dried and was sanded, most of the bubbles disappeared, but some rings were still visible. When I primed with Gardz, a water-borne penetrating sealer, many of the bubbles raised their heads again. I will have to see if they dry flat over night, or if I will have to use my putty knife to knock them off in the morning. 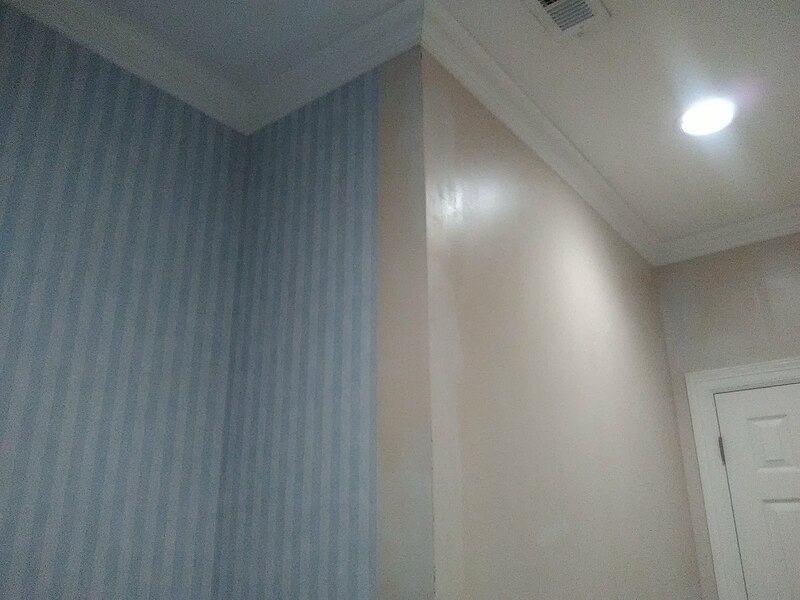 I don’t want bumps showing under the new wallpaper! 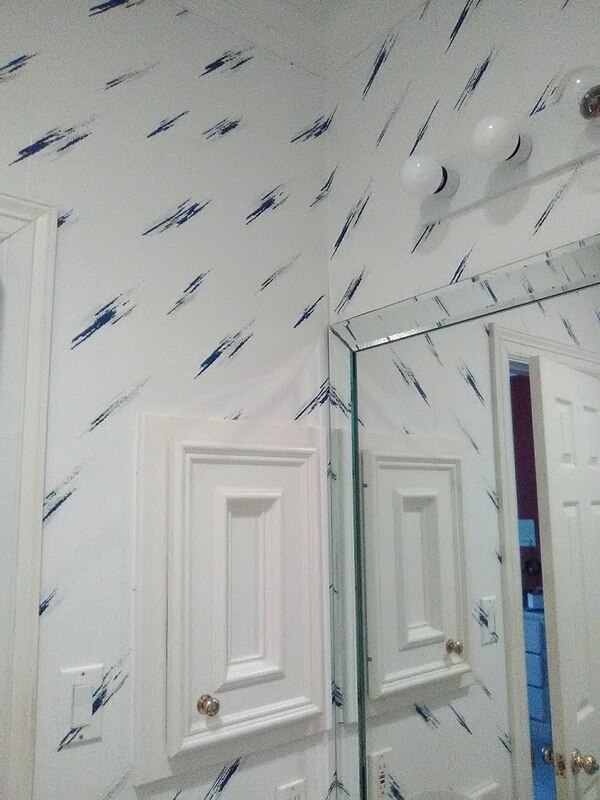 This home in Bellaire was (Houston) built in the ’90’s, and the original wallpaper (top photo) in this bathroom was outdated and had begun to curl at the seams. 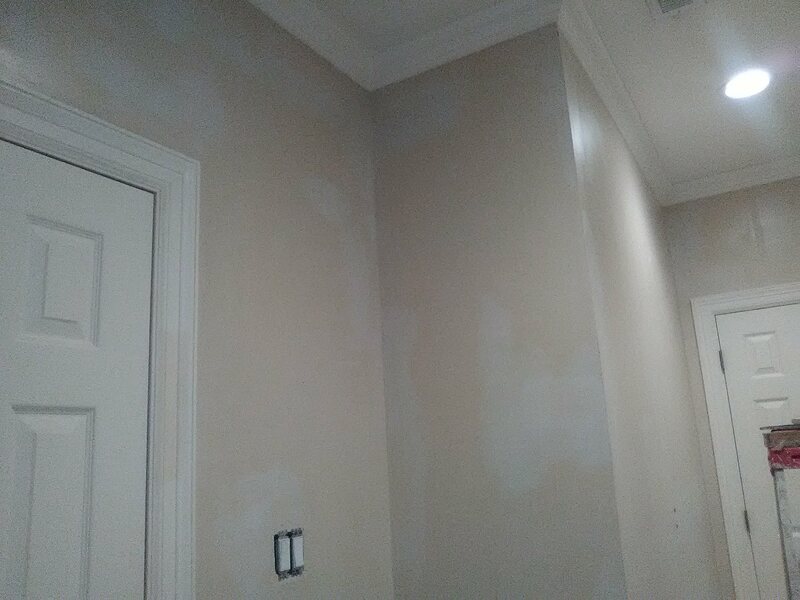 I stripped off the old paper and primed the walls with Gardz, a penetrating sealer that is a good base for wallpaper to adhere to. See second photo. 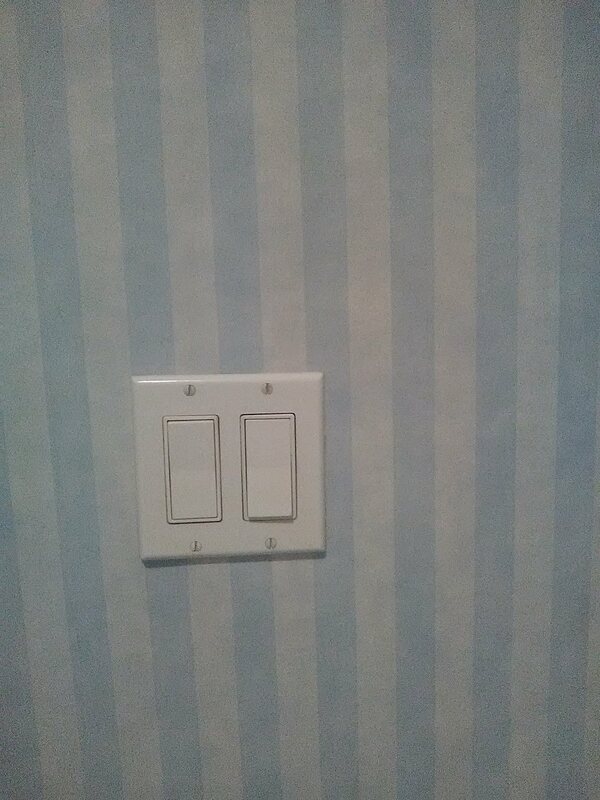 The new tone-on-tone blue striped wallpaper updates the room, and adds a softer look. 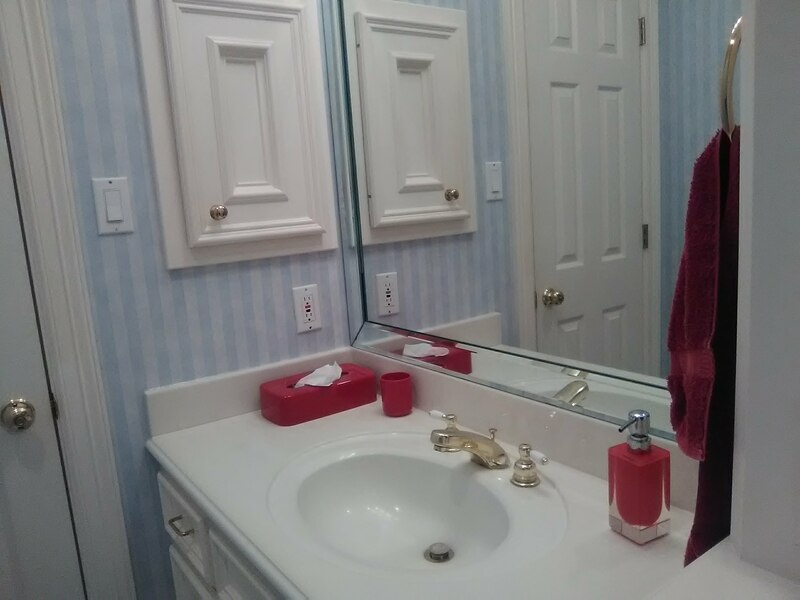 The homeowner chose cherry red accessories to accent the room. These are toned down by navy blue rugs and towels that are a slightly duskier navy and red. This paper is a pre-pasted solid vinyl on a paper backing. Despite the economical price-point, I don’t recommend these types of papers, especially in rooms that are prone to humidity, such as bathrooms. For starters, it’s difficult to install, and the seams never really look good. Second, the paper backing tends to absorb moisture from the air and then expand, and that causes the seams to curl. The vinyl surface layer is known for delaminating (separating from that paper backing). This, again, results in curled seams. This is not something that can be pasted back. So you are either left with curled seams or faced with repapering the entire room. The best way to (hopefully) avoid this is to properly prep the walls, and to keep humidity to a minimum (avoid steamy showers, keep the A/C / heating vents open, run the exhaust fan, keep the door open). Better yet, avoid purchasing paper-backed solid vinyl wallcoverings. If you shop at my favorite place (see the page on the right), you will be steered to beautiful papers of a better quality, while still at affordable prices. 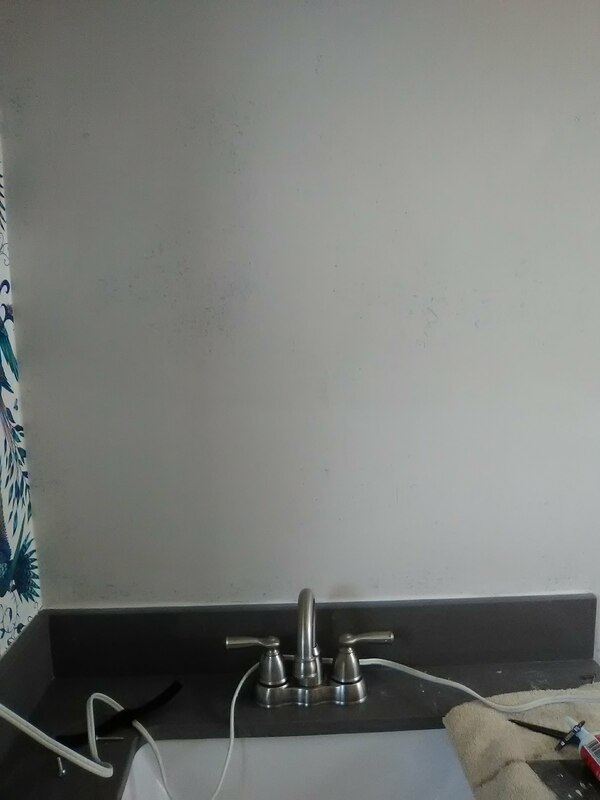 This wallpaper is dry-strippable, which means that it is coming away from the wall with just a gentle tug, rather than needing water or a lot of time and various steps to remove it. This is partly because of the type of paper and the paste used by the previous installer. 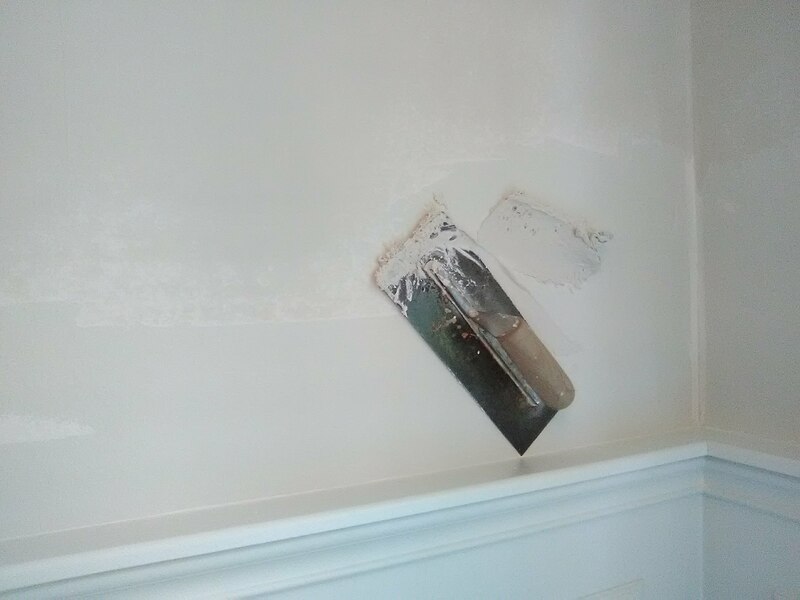 But it has more to do with the fact that he hung the paper on the porous surface of a newly-floated (smoothed) wall, and didn’t bother to prime / seal the walls first. 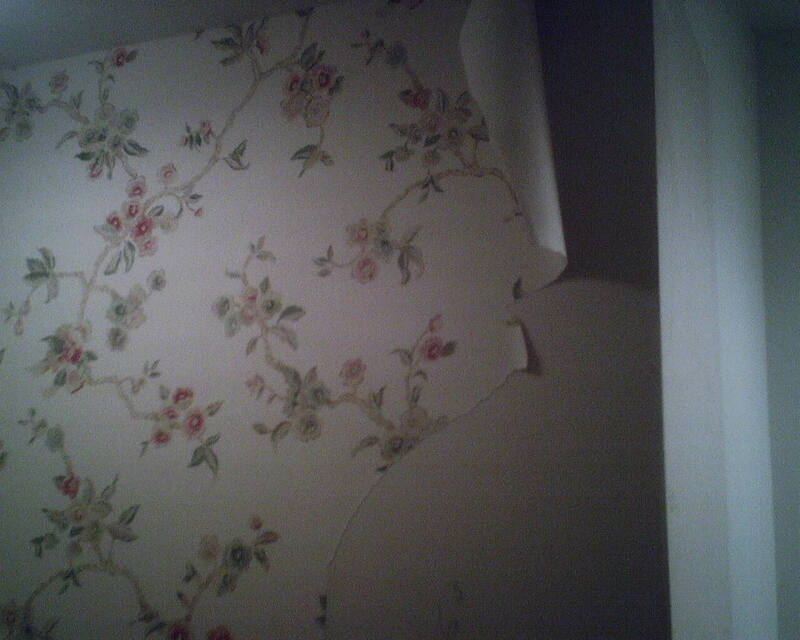 In fact, the wallpaper was failing and coming away from the wall on its own, long before I arrived to replace it. A simple primer, a few dollars, and about an hour’s time would have prevented this.